Does HR side with employees in a workplace bullying suit? Does HR ever take the side of the employee when dealing with workplace bullying complaints? The answer is that they can and do and I know of several instances where they have if the facts warrant it. But just as common and infinitely more frustrating is when they don’t – even when the facts prove the victim is telling the truth. 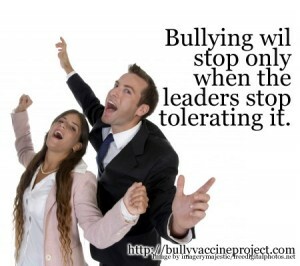 When it comes to dealing with bullying in the workplace – or anywhere really – there is the ideal of what should happen. And then the reality of what actually happens. The ideal is an investigation that is impartial and gets to the facts. The facts are then acted on in a timely and responsible manner. If someone is found to have acted inappropriately – they are either let go or receive some other consequence. In reality – there are many places in that process that might not match the ideal. The investigation may not be impartial. Even if the investigation is impartial and fair – a disagreement on what the facts mean – might happen. I’ve been chatting with an HR person about a situation where the standard of deciding what happened – was beyond a reasonable doubt – rather than a preponderance of evidence. A panel of supervisors (basically – a jury internal to the company) decided what was going on and used a legal standard that isn’t required in the workplace. In this case they decided that even though the accused had held a disciplinary meeting in a car at a remote location with a female employee – they couldn’t prove beyond a reasonable doubt he had sexually assaulted the employee in the car during the meeting. The HR person sides with the victim and believes the victim. But the outcome wasn’t in their hands. Even if this panel had decided that the accused probably did assault an employee they still might not have decided to do anything about it. In this case – the employee quit the organization. So as far as the panel of supervisors were concerned – problem solved. No action required because the person making the accusation isn’t part of the company anymore. And again – it’s not a matter of whether HR sides with the employee or not. In this case – they did and do. It’s a matter of what they are allowed to do by the company. If the company refuses to get rid of an employee that most likely assaulted someone – HR really can’t do anything about that. HR works for the company – not for the employee. The same thing can happen in schools. The person who should be helping to fix the problem – may not have the authority to do so. When my son was in grade school, there was a boy who hit my son. This boy had serious problems (home life, mental health etc). He needed help and an intervention and the principal was unable to secure the needed resources or even take corrective action. The district did not give her permission to do what she thought needed to be done to help this child. My advice, if you are dealing with something like this is first – understand who these dynamics play out. This will give you a chance to see if you can correct the situation through behavioral modification on your own. It will also put you in a position to properly document the problem to give yourself the best chance of getting HR or the principal’s help in the situation. And if that still doesn’t work because there are forces beyond your control – you will at least put yourself in a position to leave ethically and professionally. My book and resources can help you learn what ideally needs to happen to make bullying behavior stop. And that’s a start. So get the book and join the website and get access to all the free materials I offer.